Pliny the Younger, the man, was Pliny the Elder’s nephew and adopted son. They lived nearly 2,000 years ago! 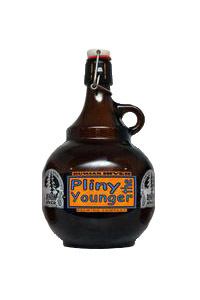 Pliny the Elder is our Double IPA, so we felt it was fitting to name our Triple IPA after his son. It is almost a true Triple IPA with triple the amount of hops as a regular I.P.A. That said, it is extremely difficult, time and space consuming, and very expensive to make. It is also deceptively well-balanced and smooth. A taste of tropical forest in a bottle! You will be surprised with its exquisite flavor which is a mixed of citrus, pineapple, and some other loads of fruits. You can also taste something floral in it. It is incredibly smooth which can be shocking with its 11% ABV. This is a really top-notch beer.